"Don’t be silly. There’s no such place as Foulney Island; it’s a product of your over-active imagination" said my friend Ian, years ago. And he’d been born and brought up in Ulverston, so he should have known better. He’d driven home from Barrow by the coast road one evening to see for himself. Then he’d called in to see me, admitted defeat. (I like a bit of 'told you so' every now and then.) But in a way I thought years later, he’d had a point. Foulney is always there, of course it is, but with its highest point standing at just three metres and its surface entirely flat and grassed over, it could easily be missed. And Ian isn’t the only local I’ve met who didn’t know the island existed. From the road it’s just a raised grassy shingle bank, and at high tide there’s not an awful lot to see. You might not even think to call it an island if you drove past on the way across to Roa Island and saw the bank sweeping away out into the bay. But go out there and see . . .
November came in like a lamb. Still no frost to speak of but at last a break from the dull, damp final weeks of October. I hate the days without breaks in the cloud cover, I never get used to it; I feel hemmed in, tied down. But Callum was home from Edinburgh for the weekend, and checking the forecast for Barrow I’d seen that it was good. I checked, too, by looking out from the hall window and looking south and seeing the lighter sky. We drove over, passing through showers as dark as thunder and on to clearer skies on the coast road, and parked up just off the main causeway to Roa Island. As we pulled on our boots and jackets a story came back. I had friends from north Cumbria who lived up in the wilds above Brampton. They’d converted an old ambulance into a camper, and drove it down for the Town Hall Centenary celebrations in Barrow, an event that included the hoisting of a giant pair of Queen Victoria’s undergarments from a flagpole above the Town Hall clock. That evening, as everything was winding up, Mike asked me to suggest a place to park for the night, somewhere they could wake up in sight of the sea, and I’d said Roa Island. Days later Mike phoned me. "We found the car-park okay. No-one else there; not surprising really seeing it was already dark. We got settled in, got to sleep, but I needed a pee. Got up in the middle of the night and found myself standing in water at the bottom of the steps. The tide had come right up to the edge of the road!" He just hadn’t driven quite far enough along the causeway and had stopped short of Roa Island. "I got the van out of there alright, but it was bloody lucky I needed a pee, that’s all I can say!" Just as well. That might have been my credentials as an incipient tour guide shot to pieces. Cal and I set off to walk to Foulney an hour before low tide. The causeway from the Roa Island road to the island was built by the Victorians as protection from the tides. It’s a curving mound made of rock and shingle and concrete, and there are great gaps in it where the sea has torn chunks away. We picked our way along looking down at sections of perforated black rocks like volcanic tuff. At the car park it’d been warm and we left behind our hats and gloves. The further we walked out, though, the wind grew stronger and colder and we zipped ourselves tight inside our jackets. I stopped to look through the binoculars at something moving out on the sands. Into the lenses rolled a large white ball, a child’s beach ball. We wondered if it’d blown all the way over the bay from Morecambe, what with the wind coming from due east. A solitary egret flapped out from the saltmarsh towards the distant sea. Over time the island moves and shifts. You can see it by looking at the line of the causeway, and if it were thought of as the island’s spine, it’s as though this had been picked up and moved, transplanted into a different part of the body of the beast, but of course it’s the island that moves and flows around the causeway. I liked this sense of an island as a dynamic, ever-shifting structure. Once on the island itself we saw how it had been formed out of flat shingle, mountainous quantities of it, swept up towards a flattened crest where the tides had lifted the stones and re-deposited them in successive waves. Pity the poor wading birds nesting here I thought; just one high tide and all evidence of their nests would be gone. We walked up onto the grassy plateau passing close to the high tide line of sculpted shingle, mussel shells, blue polypropylene rope, (why always blue? ), crab casts, deposits of blackened seaweed, plastic milk bottle tops, dried grass, twigs and dried plant remains, and far too many plastic bottles. A procession of twelve foot high metal poles led down the island, leading past a white tower that looked as if a rocket had crashed vertically into the earth. As we came closer it morphed into the base for a shipping-light orientated towards the outer limits of the bay. Further on a concrete shed with most of the lower panels bashed out by the ravages of weather. Cal went inside and started to read the graffiti that was sprawled across the bare interior walls and all that was visible of him were his legs and feet. I went inside too and hunkered down to look at two large blue fishing crates packed to the gunwales with large flat pebbles, each painted with a code and a number. OC 57, AT 48, RP 16, Lt 27, and then I got it: markers for the nest sites of oystercatchers, arctic terns, ringed plovers and little terns, left here by the Cumbria Wildlife Trust wardens after the end of the breeding season. The little terns decamped over to Walney’s west coast, but no chicks were seen. There’d been 56 pairs of arctic terns settled on Foulney but again no offspring. Predation by foxes is a factor of life and death for the ground nesting birds here, and it was a canny opportunist who’d cleaned out all these eggs and chicks. I thought of the she-fox I’d seen at Aldingham after the spring gales and storms, and though I’ve always been a defender of the under-dog (or fox), I know how I’d feel if I were to see it nest raiding. At least the wildlife trust has new funding and a five year plan to improve the island for the ground nesters. I made a mental note to come back in late spring and see the island alive with birds. A better adapted species, the eiders, fare much better. Morecambe Bay is the most southerly range of breeding eiders. Wardens had counted 170 chicks out on the water ‘rafting’, where adult birds gather the entire colony’s chicks together and care for them collectively, both for safety and to teach them survival skills. As we walked on, in the far distance at the island’s end I saw eiders winging past in pairs or in small groups. Cal and I began to wonder if we’d ever reach the end. Ahead the shingle had formed into two banks that extended out, wide from the central spit of land, like arms lifted at right angles to the body. To the right of us waves broke quietly at the low-tide edge of Walney Channel. A man in fishing gear walked rapidly along the edge of the sea. He was walking and stopping every so often to pick something up, but what, we were too far away to see. 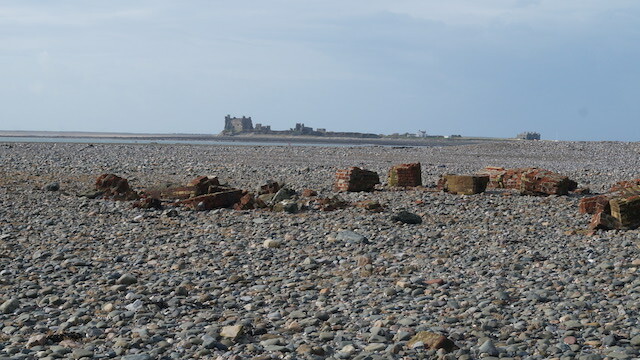 A land rover appeared moving over the sands exposed at low tide off Walney Island. It was being driven towards Piel Island, but once we’d taken our eyes off it, when we looked again it’d disappeared from view behind the islands’ only row of terraced cottages. Gulls lifted and settled out at the far end of Foulney. As they rose upwards the sun caught the underside of their wings, gilding them like hot white metal. They glided, surfed air, drifted. At last, we came to a slight rise and what we thought must be the end of the shingle bank, but it wasn’t so. At this very low tide a swathe of rocky mussel beds extended out at least as far again as the length of Foulney. The ground was rocky and firm and we walked part way out to where the sea played, still distantly, coloured aquamarine, and where birds landed, foraging on the newly exposed mussel beds as the tide continued to retreat. "It’s like the moon", Cal said. And it was, an utterly grey, or colourless landscape and something, we both thought, we’d never seen before; land that had had the colour sucked out of it by the heave and flow of the tides. Two towers of red, scaffolded metal, presumably to mark the extent of the mussel beds to shipping, had been left high and dry, beached on the lunar landscape, like forgotten remnants from a film set. There had been a simple shelter at the end of Foulney. I’d seen photos of it recently on the internet. A dry-stone arc of cobbles to keep the wind off. But the structure had disappeared, must have been sabotaged by the storms that hit the bay in the spring. Bizarrely though, on the barren shore great chunks of a demolished red-brick building had been scattered (if you can use the word ‘scattered’ about weighty chunks of a building.) Whatever it had been, it’d had glazed white interior tiles as if from a school toilet. This was the north-western extremity of Morecambe Bay. Given the state of the tides I doubted if the sea ever dropped back further than this, so anything watery out from here was the meeting place of the bay and the Irish Sea. In the distance a ferry ploughed steadily through the deepwater channel in towards Heysham. Group after group of eider came winging over the channel from Walney Island, and with the wind behind them they moved effortlessly and at great speed. I wondered what that must feel like and I envied them, covering that distance, and being able to get right out there at the very edge of things. Following their drift we saw that at the very far end of the northerly ‘arm’ that pushed north into the bay, there was a row of what appeared to be ancient, blackened fishing nets strung out. How far away? Perhaps another mile or even two; the distance difficult to judge. The birds did it in seconds. By then the cold was enervating. I needed to get out of the wind, to stop it bashing me around the head, and we turned and began to walk back towards the shingle. At the top of the beach small cliffs had been scoured out by water and weather, no more than a couple of feet high. We stopped to take photographs of them. Here was the evidence, were it needed, that the whole island is made up of nothing more than a monumental stash of pebbles, all of them flat and rounded, and all stitched together with a scant mortar of soils and sediment and the penetrating, binding roots of grass. Between Roa Island and Walney wind surfers skimmed and bounced along the water. The wind was gaining strength continually and white caps were lifted out of the water. As we came back in sight of true land, another egret lifted from the marsh and disappeared out towards the middle of the bay. Collapsed and rusting at the side of the causeway road to Roa Island, there’s a wrecked trawler. We walked around its bulk, taking pictures and wondering how it had come to be here. Someone had scraped back the rust and begun painting its hull bright yellow, though the job had never been completed and the newer paint had been bitten into again. Back home I found photos of the ship on the web, and the story of a family who’d taken it on and were making it into a home – of sorts. I guessed they’d abandoned her for a less arduous life by the time we were there. They’d called her the Vita Nova, which had a kind of extra poignancy attached to it, the ship having had the life taken out of it twice. It must have been an adventure; without the high seas but with some of the romance. I couldn’t imagine how that would be though, living your whole interior life at a tilt. I find normal interior life challenging enough. I studied the Ordnance Survey to understand the lie of the land around Foulney, and there on paper the extent of it was made clear. Foulney itself becomes changed, no longer an island but a pathway out to the huge swathes of mussel banks exposed by low tides. There are even place names, the litany of each of them a story. The ridge where we saw fishing nets Slitch Ridge. Further north again, Long Barrow, Long Barrow Ridge, High Bottom, Blackamoor Ridge, Conger Stones. The scaffold lighthouse we’d walked out to, Foulney Hole, and I now see is a mile further out from the end of the island. Ragman Ridge and Farhill Scar in towards the Walney Channel. Foulney Twist, further out again, sounds like a kind of local tobacco. Then three more features further out into the bay caught my eye as it travelled over the map. The first a tiny scar, St Helena, presumably named for the demise of a certain French Emperor. Further out again, another shingle bank: South America. But the next one unimaginable in a million years. A tiny scatter of rocks out towards the extending finger of Mort Bank sandbank: the Falklands. And I wondered if this had caught the eye of the Argentineans who’d been here in the late 70’s and early ‘80’s, working together with my father in the shipyard, before we went to war. This piece is an extract from Karen's unpublished book The Gathering Tide: A Journey around the Edgelands of Morecambe Bay. Karen Lloyd lives in Cumbria on the edge of the Lake District and graduated from the MLitt at Stirling University in 2014. Her writing focuses on land, observation and history and she is a member of Kendal's Brewery Poets.